An Irvine home had a kitchen and bathrooms in need of renovation. APlus was called in to freshen up the spaces with professional construction and interior design. 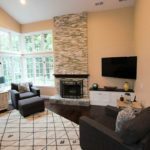 Prior to the renovation, the kitchen was very subdued, with a subtle country style that was dated and not in line with the owner’s personal tastes. It also had a cramped layout that made the entire space feel much smaller. The old kitchen was knocked out entirely so that we could rebuild it in an open L-shaped layout. 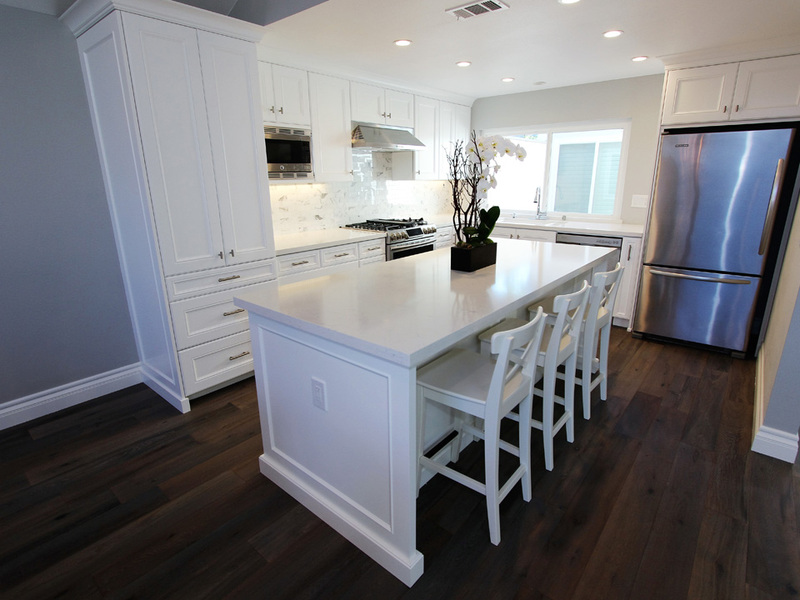 We started by laying down new hardwood floorboards in a rustic-chic ash brown hue. Then, we got to work on the new custom cabinets. We built them in a Euro construction out of Maple, with Tuscan-style doors, crown molding, and a Straight White finish. 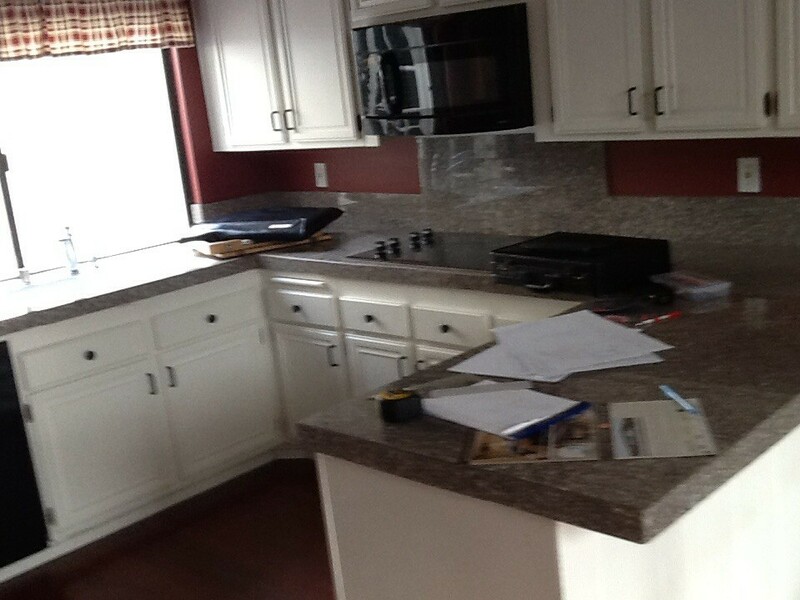 Light rails were installed beneath the upper cabinets to add some countertop illumination, and all of the doors and drawers were mounted with Key West Knobs and handles. 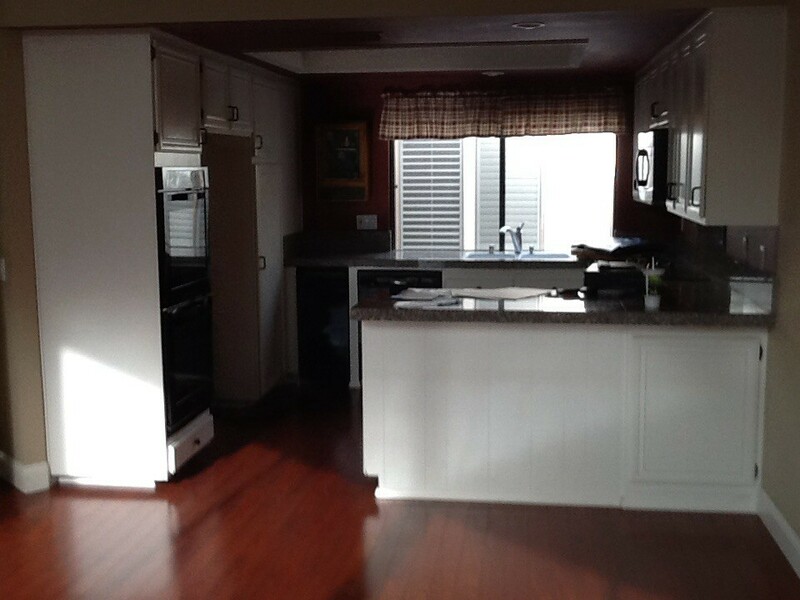 Some of the custom features include spice pulls, lazy suzans, tray pull-outs, and folding corner doors. 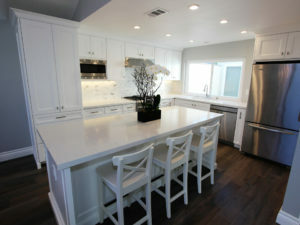 Our team constructed a center island to provide an additional work surface, as well as a bar area for relaxed seating. 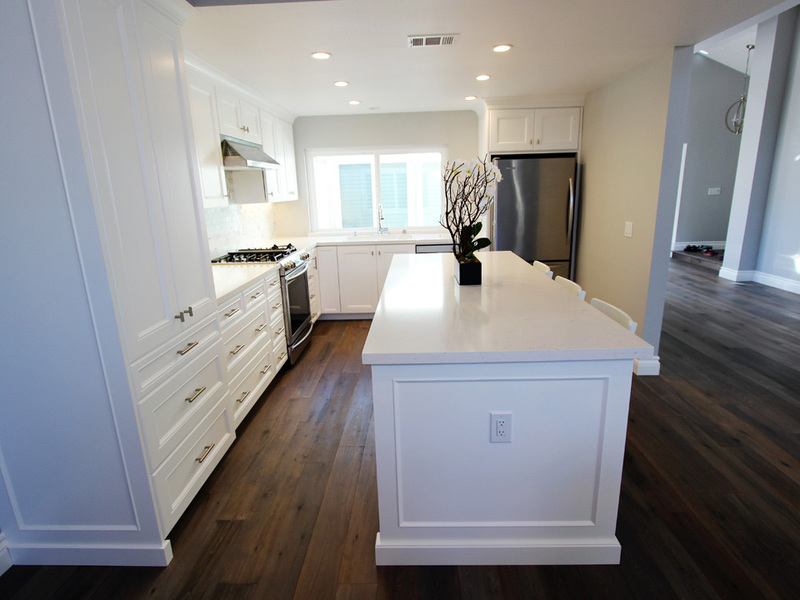 Pental Venatino Polished Countertops with 1 ½” Straight edges were put in, completely matching the cabinetry and creating a seamless, sleek look. A full-height backsplash of glossy, pale marbled rectangular tiles visually connects the space between the upper and lower cabinets. One of the finishing touches was the installation of recessed lighting, which brightens the room and adds an extra modern element to the kitchen’s new Transitional vibe. 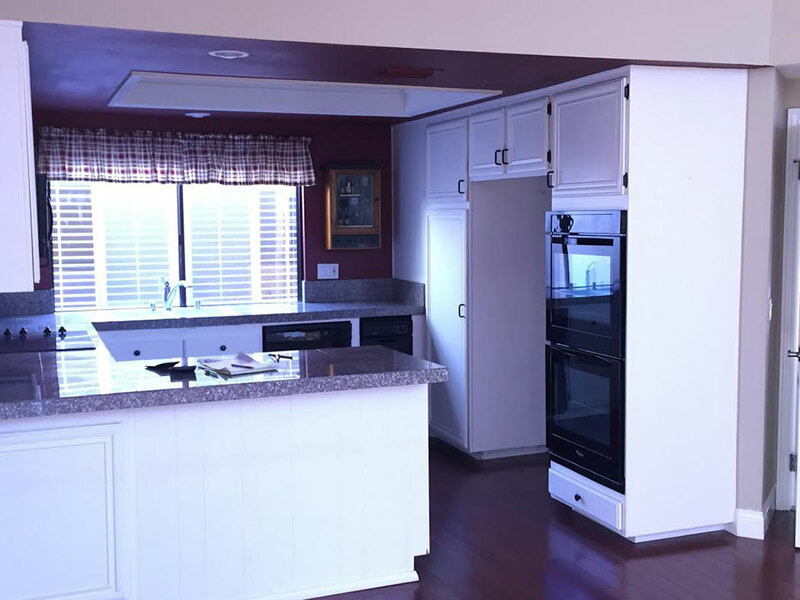 To keep the kitchen’s new design looking polished and current, the client elected to go with stainless steel appliances from a few of our premium suppliers. The large KitchenAid Bottom Mount Refrigerator is built into the cabinetry, next to the Samsung Dishwasher. 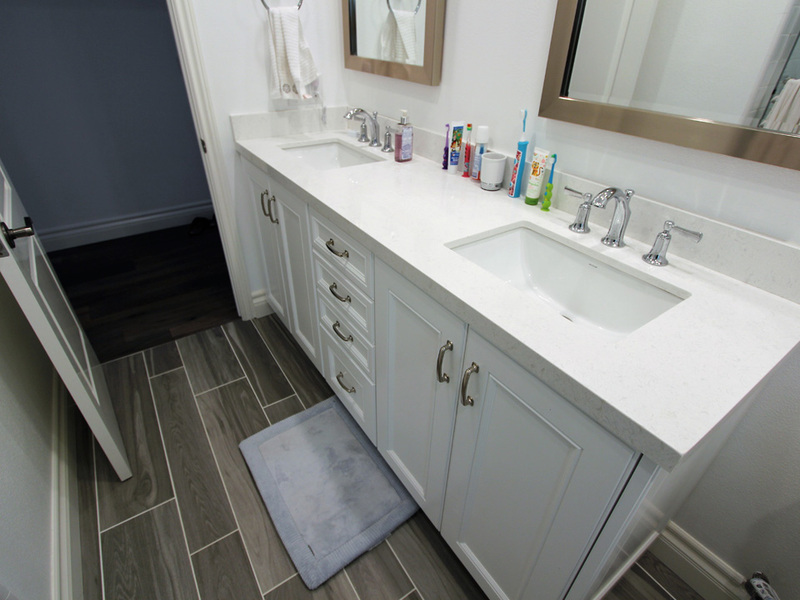 To the left of that is the Kohler Riverby Undermount Kitchen Sink, in a pristine white finish that makes it feel like a part of the countertop. A Whirlpool 30” Range Hood was mounted above the Samsung 5.8 cu. ft. Slide-in Gas Range with Intuitive Controls. 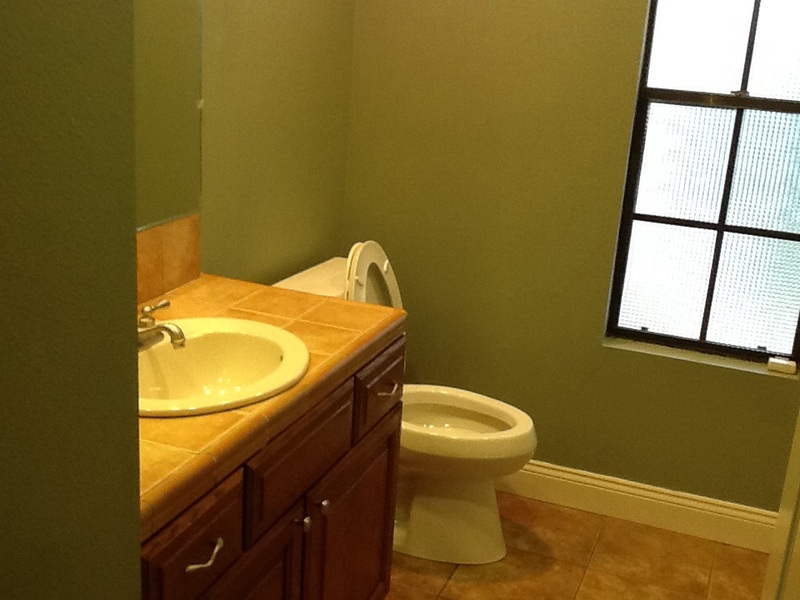 Both of the home’s bathrooms were renovated to have a light and airy appearance, similar to that of the updated kitchen. 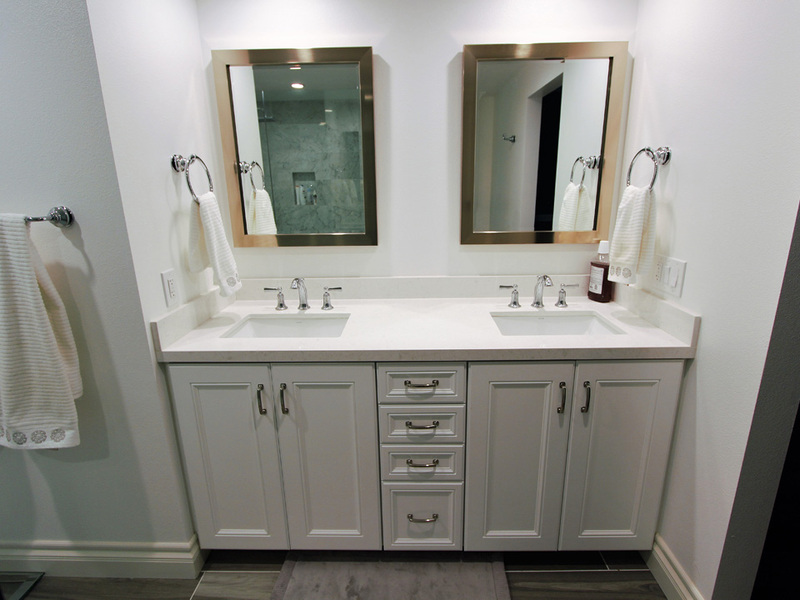 The same cabinet materials were used to create both of the vanities, which house his and hers undermount sinks. A differentiating touch is the use of Belcastel Handles and Knobs, for a more traditional style. 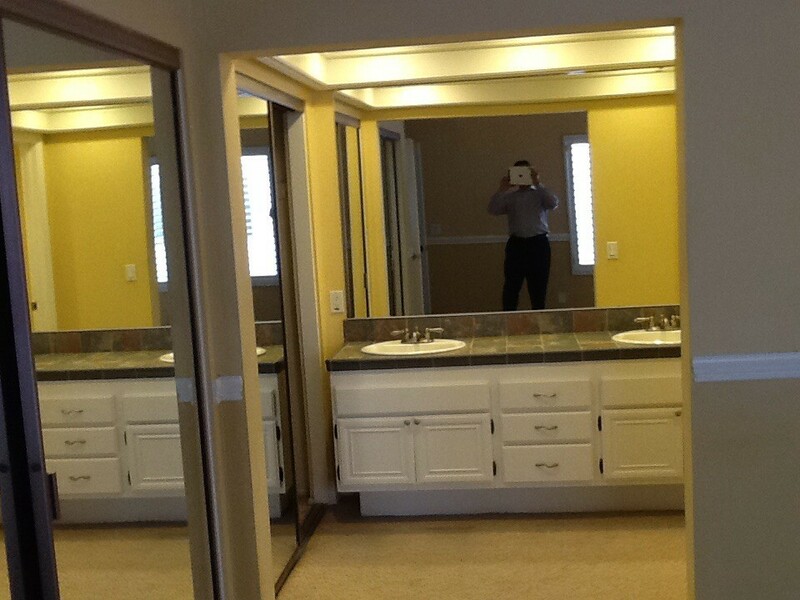 APlus handles all kinds of home renovations in the Orange County area. 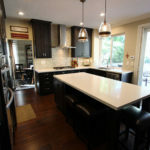 If you’d like to talk about your ideas for your own kitchen, bathroom, or other type of remodel, reach out to us! Our friendly team will be happy to help.